I'm more of a Haymarket kind of guy where I can get 50 limes for a dollar, but I do occasionally like to frequent Farmers' Markets as well to see what's available there. I recently had some pretty tasty apple cider. 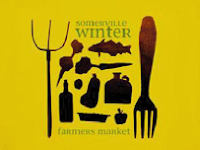 The City of Somerville is celebrating the second season of its highly successful Somerville Winter Farmers’ Market, which will take place Saturdays from 9:30am to 2:30pm at the Center for Arts at the Armory. A soft opening will take place Saturday, November 12th and 19th and the market will run every Saturday through May 26th with the exception of November 26th. The winter market represents a partnership between Shape Up Somerville and the Armory and is part of the city's commitment to healthy living. In its inaugural season, the market drew 2000 shoppers every Saturday and the market is expected to draw even more this season with the extended hours of operation of 9:30am to 2:30pm. Shoppers can look forward to seeing all of their favorite vendors from last season in addition to several new ones. 0 Response to "Somerville Winter Farmers’ Market - Saturdays"